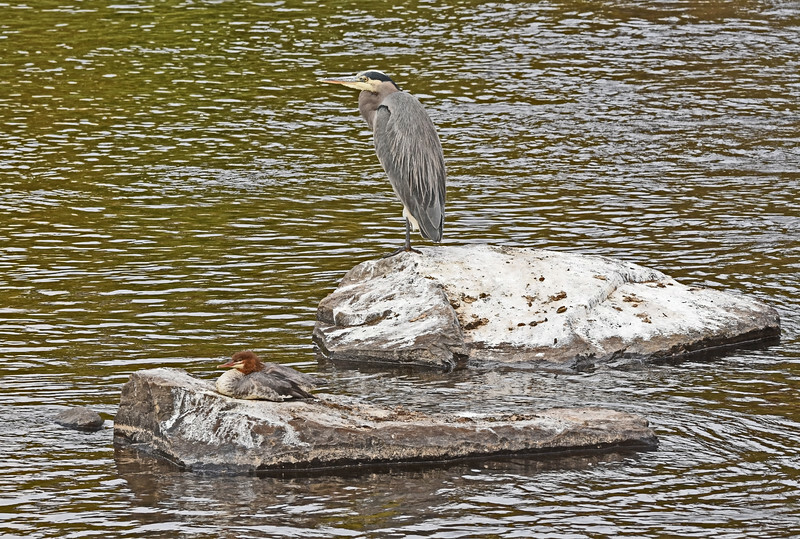 Nora and I took our walk at Rooks Park so I could test a "New" refurbished Nikon and, although we went at midday, as we crossed the bridge, I saw our old familiar Great Blue Heron standing on a rock adjacent to the outhouse a good 100 yards or so down stream. The "model" remained "posed" until we arrived at a parallel spot maybe 20 feet away and I realized a merganser rested on a rock close to the heron. Nora sniffed around behind me, near the toilet, and I took occasional shots with the camera on a mono pod and waited for the big bird to do something interesting. It yawned once and eventually appeared about to launch, I failed to shorten my lens and didn't get full images at first. Then after shaking itself, the bird returned to standing still on the fouled stone. I pondered the idea that the bird stood on a rock covered with droppings so close to the outhouse. The merganser never moved. I finally took a shot of the bored stiff Nora where she sat and we went home.